The entrance to LMC’s Annual Meeting in San Diego. Wayne, Penn. — LMC dealers gathered in San Diego this year for the group’s annual meeting. Each year, LMC dealers from across the country come together for the buying and networking opportunity. This year had an added level of excitement, LMC said, as dealers and exhibitors spoke of the $4.8 billion in purchases that LMC achieved in 2018. LMC held its 84th annual meeting in San Diego from March 21 to 23. On the show floor this year were a number of specialty exhibits including: the House of ModernView, Kitchen & Bath Showcase, Capital Equipment exhibit, and the New Products Showcase. Second place went to SKILSAW Power Tools for their 16″ Worm Drive Carpentry Chain Saw. Third place was Delaney Hardware’s Deadbolt Z-Wave Smart Touchpad with Camera Bridge. 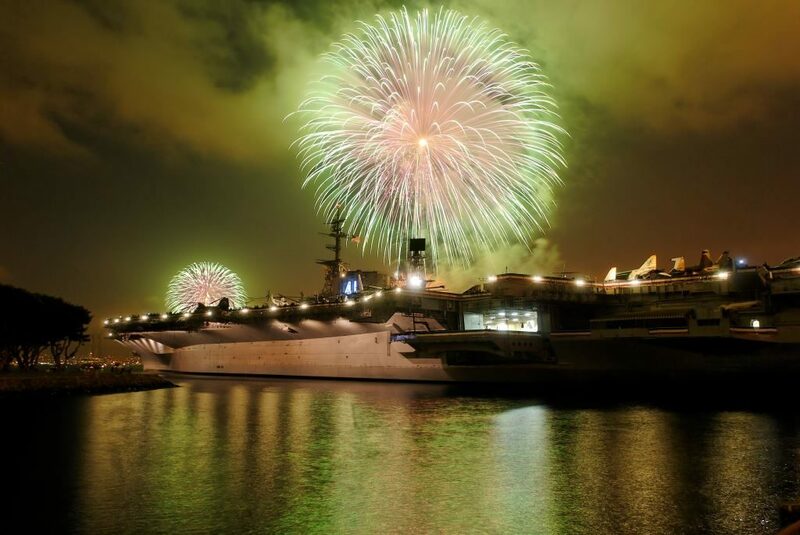 LMC Annual Meeting attendees were treated to fireworks aboard the USS Midway. Friday night LMC hosted an event aboard the USS Midway. Guests enjoyed tours of the ship, flight simulators, and a plethora of antique aircrafts. The night culminated in an fireworks display, sponsored by Huber Engineered Woods. In addition to the buying and networking opportunities afforded to LMC dealers at the show are the educational opportunities, LMC says. There were a number of National Kitchen & Bath Association accredited courses offered as part of the second annual Kitchen & Bath Showcase. There were also education sessions on the topics of social media marketing, leading in the artificial intelligence age, brand management, employee loyalty and retention, and recruiting. New this year was a round table offered by LMC’s Component Alliance—a newly reinvigorated group of dealers who are involved in truss manufacturing. The round table featured industry facilitators from Mitek, Canfor, and Interfor. The groups discussed hot topics in the industry.